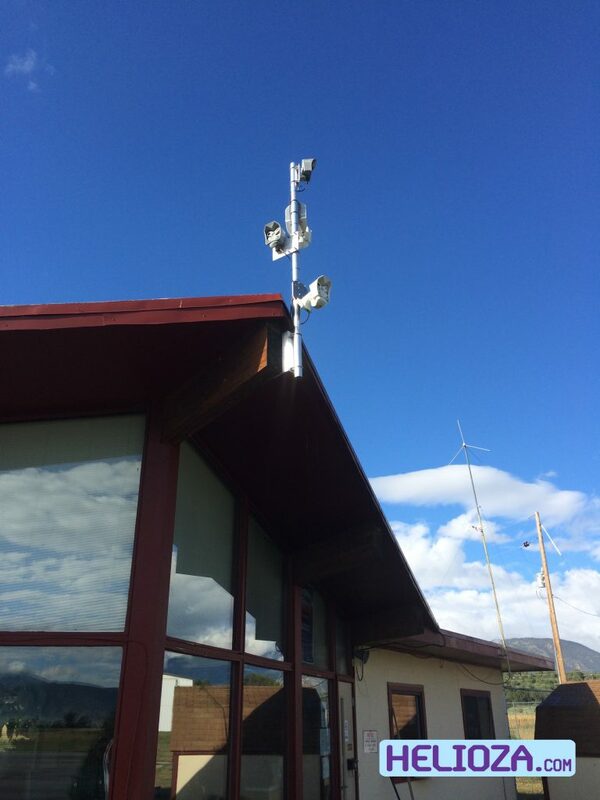 These are four weather cameras installed atop the FBO (Fixed Base of Operations) at Harriet Alexander Field Chaffee County Colorado. The airport is about two miles outside the town of Salida in south-central Colorado. The airport identifier is KANK. I installed these cameras at that location, primarily to serve pilots. Howerver, many other people wind up using the cameras as well because pilots aren’t the only ones who have an interest in the weather. Accessing the roof was fairly easy, and actually, for these cameras I didn’t get onto the roof until the last step. First I just used a ladder to attach the mounting bracket to the roof peak. That timber at the roof peak is huge and I bolted a quarter-inch-thick aluminum angle extrusion to the wood. The mast is a very stout tube of one-tenth-inch-thick aluminum fastened to the bracket with stainless-steel U-bolts. Yes, it’s over-designed, but like most places in Colorado, high winds are common. Since these camera images are strung together into time-lapse sequences, minimizing camera shake is important. Suffice it to say, the cameras have all failed one-by-one and been replaced, but the mount is still as solid as the building.